The Weslo Cadence C44 treadmill is probably the only treadmill in the market today that offers an adjustable incline feature for less than $400. But don’t jump for joy yet, as this inclining treadmill might not last very long. It comes with poor quality so don’t expect it to be useful after a year or so. Check out other Weslo treadmills at reduced prices here. For those who do not intend to run on this machine, this might be a decent choice for a starter treadmill especially with its incline feature. However, if you plan on running, I don’t think this machine will suffice. You have to spend more money in order to get a treadmill that would fit to your need. May I suggest you find one using our best buy treadmills page. What the Weslo Cadence C44 offers? The Weslo Cadence C44 comes with a 2.25 THP Impulse Drive motor. This motor is good enough for those who love to walk. It has a max speed of 10mph but you should not take full advantage of it mainly because of its cheap parts and poor quality. 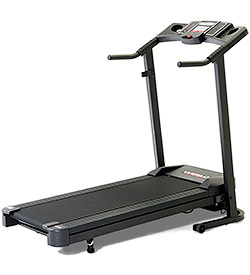 The 16” x 47” tread belt provides enough room for walking or jogging mainly since this is an under $400 treadmill. This running surface also comes with Comfort Cell™ cushioning which lessens impact on your joints. One of the key selling points of this machine is its adjustable incline feature. This treadmill will most likely be the cheapest you will find in the market today that offers it. This feature allows you to do your exercises uphill to burn more calories without having you to manually lift and lock it in an incline position. Other features include a large LCD display which gives workout feedbacks and an EKG™ heart rate monitor for those who workout using their target heart rates. It also comes with a 1 year motor warranty but does not offer any parts or service warranty. This simply proves that they used cheap parts with this machine. The main weakness with this machine is that it comes with cheap parts and poor quality. But that is to be expected with all entry level treadmills. If you’re looking for a quality unit, you might want to check out our best buy treadmills page. I would recommend the Weslo Cadence C44 treadmill as a starter treadmill but only to those who plans to walk on it. Although this machine might look attractive for those on a limited budget, I don’t think it is fit runners considering that cheap parts were used. So if you are a serious runner, I suggest you visit our best buy treadmills page and choose a unit in the $1,500 or above price range. If you plan on buying a Weslo Cadence C44 treadmill, I suggest you buy from Amazon.com. They offer the best price on the net. You can get it for just $333.